More than 22 years after the Gukurahundi massacres ended, that sad episode in Zimbabwe's history continues to rear its ugly head with the deputy minister of Defence, Victor Matemadanda this week rushing to defend President Emmerson Mnangagwa - seen as the chief architect of the atrocities. Matemadanda, who is also the secretary-general of the Zimbabwe National Liberation War Veterans Association (ZNLWVA) claimed last week that the buck should stop with Robert Mugabe who, as prime minister at the time, had the State machinery vested in his hands. He was reacting to stinging attacks targeting his boss by Mugabe at a private 95th birthday party held at his plush palace in Borrowdale, Harare where the teetotaller denounced the use of lethal force by Mnangagwa to crush fuel protests that were organised by the main labour union, the Zimbabwe Congress of Trade Unions (ZCTU) last month. "He who is obsessed with seeing corpses everyday will soon realise that people would clamour too to see his corpse one day. I say to soldiers stop killing people," Mugabe fumed. "What you are doing (killing people) is going to catch-up with you very, very, soon. Just tomorrow, it would have caught up with you," Mugabe warned ominously. 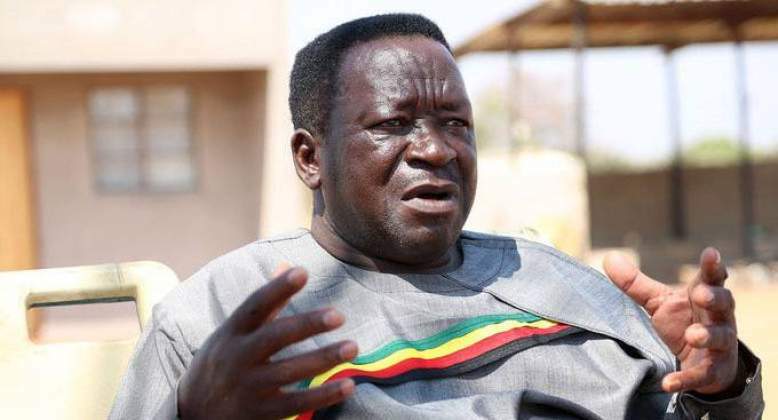 But addressing a press conference early this week, Matemadanda blasted Mugabe saying it was strange that the former guerrilla leader was attempting to heap the blame on his subordinate. "Even though you may want to forgive the old man, I do not think he deserves forgiveness because surely how can Mugabe have the audacity to tell Mnangagwa not to kill when he is the specialist in that area? "We survived by fleeing this country, Mnangagwa himself escaped death by a whisker, Mugabe is the known and approved killer, I think he should have said you are taking my job. I once went to Matabeleland (and) told chiefs (there) to take cattle from Gushungo Dairies for him to appease the spirits of those he killed during the Gukurahundi; this is what is making Mugabe lose his senses," said the ZNLWVA secretary-general. Mugabe's outburst were met with an immediate response from outspoken Information deputy minister Energy Mutodi who used micro-blogging site Twitter to call the former president to order. "We have noted some words of repentance by former president Mugabe saying the army must protect not kill. True that a few have lost lives in running battles with the police but that cannot compare with Gukurahundi or the 2008 violence when he was at the helm," Mutodi said. An estimated 20 000 defenceless civilians died during the Gukurahundi era when Mugabe unleashed a North Korean-trained army unit to crack on alleged dissent to his rule in the Midlands and Matabeleland regions. Mugabe is on record referring to the episode as "a moment of madness". Mnangagwa has distanced himself from the disturbances, mandating the National Peace and Reconciliation Commission (NPRC) and traditional leaders to tackle the issue, adding that he would appear before it if the affected communities ask him to. But while the NPRC was well received in many quarters, it was not the same in Matabeleland region where many human rights activists refused to recognise it on the basis of its composition. The activists felt that the commission would be biased in its operations since it only has one Ndebele speaking member in its ranks. Matemadanda's attempts to exonerate Mnangagwa drew brickbats from the likes of former Higher and Tertiary Education minister Jonathan Moyo. A former politburo member who is now living in self-imposed exile, Moyo claimed on Twitter that he used his time in government to gather information about Gukurahundi. "Only fools think we didn't access critical information on Gukurahundi when we were in government. A lot of critical information (including dockets) was collected and secured from 13 to 30 Nov 2017. Gukurahundi is so well-documented that the truth is known," said Moyo. He said the director of the whole episode was Mnangagwa, who was back then the minister of State Security in charge of the dreaded Central Intelligence Organisation (CIO). "The deadliest force in the #Gukurahundi atrocities was the CIO, the lead. Directed by Mnangagwa, who administered the State of Emergency Act and liaised with ex-Rhodie and apartheid killers, the CIO gathered ‘intelligence' via barbaric torture & murder on an industrial scale," said Moyo.